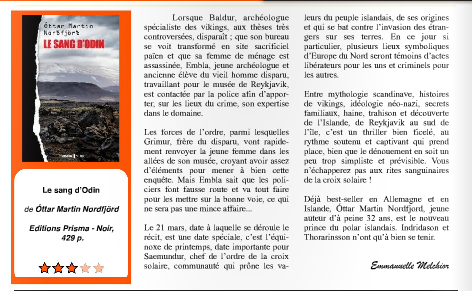 Le Sang d'Odin got its first review, three stars out of five, in a magazine called Le Suricate Magazine. It says among other things: "It is a well-crafted thriller, the rhythm is sustained and what takes place is captivating ... You will not escape the bloody rites of the solar cross!" And: "Already a bestseller in Germany and Iceland, Óttar Martin Nordfjord, a young author, just 32 years old, is the new prince of the Icelandic thriller. Indridason (Arnaldur) and Thorarinsson (Árni) have to watch out." The review is here and in French. And apparently, the novel has also been chosen for some kind of competition of Scandinavian thrillers on this blog.